Manutec Gangs of Press Wheels are detachable. They can be easily interchanged with a set of harrows or removed completely if required. They are also very simple. They have only two bearings per unit. The two most common reasons for customers not wanting gangs is perceived uneveness of pressure and the fact that gangs do not follow around on the turns. For customers in relatively clean country who tend to sow up and back, these two perceived disadvantages are not likely to be an issue. Regardless of these two perceptions, Manutec still have many customers that are working in some pretty rough conditions and sowing round and round who use gangs and are very happy with the results. 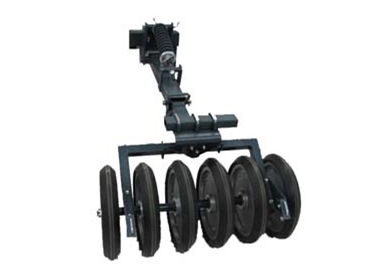 For customers with an existing set of gangs on either a Flexi-Coil or Bourgault machine that are either worn out or not working for some reason, these gangs of press wheels can be easily modified or refitted using Manutec Wheels.